Congratulations to Bill Twigg and The Norman Wettenhall Foundation for their successes at the 2013 Victorian Landcare Awards in Melbourne on the 28th of August 2013. Bill was the recipient of the Regional DEPI Sustainable Farm Practices Award for the North Central region. As a local farming and Landcare guru, Bill continues to sit on the LPLN Committee, bringing a valuable voice to the table. Well done Bill. 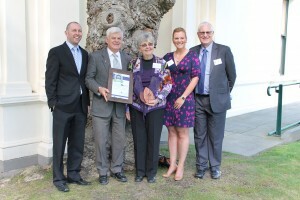 The Norman Wettenhall Foundation was the recipient of the Partnerships with Landcare Award. The Loddon Plains Landcare Network is very fortunate to have a partnership with NWF on our GOANNA Project. The Network would like to congratulate NWF on the well deserved recognition of this award, and look forward to continuing to work with NWF to achieve important landscape changes across the Network area. A video of the awards can be found here. Photos: Left – Bill and Gwen Twigg with North Central CMA representatives. 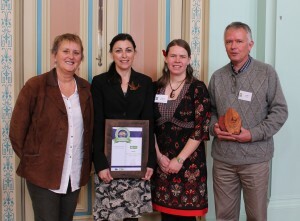 Right – Beth Mellick and Geoff Park from The Norman Wettenhall Foundation with their nominators from the Yarram Yarram Landcare Network.